As a teenager, I used to do a lot of babysitting. It was perfect for me, I loved babies and young children, I could watch whatever I wanted on TV and I got paid to do it! Nowadays, I sometimes babysit for a friend or my sister in the hope of earning credits for them to return the favour and let me and my husband go on a rare night out. 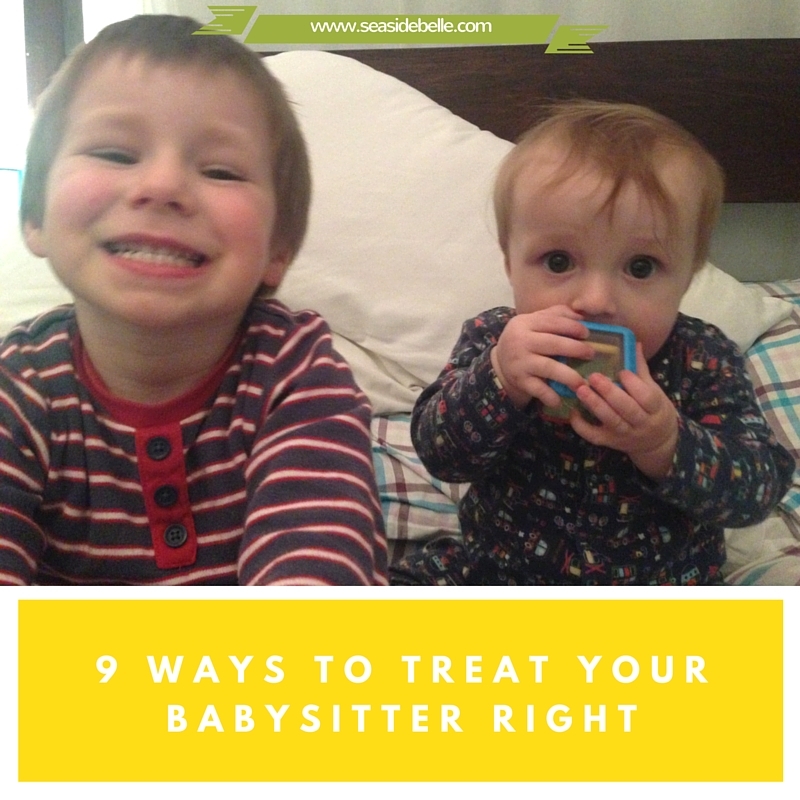 Whether you're paying for a babysitter, involved in a formal or informal swap system or use family to cover your childcare, there is a certain etiquette for the way you treat your babysitters. Try and get the children into bed (ideally asleep) before you leave. If this isn't going to happen, let the babysitter know what to expect and what the bedtime routine entails. There's nothing worse than hustling your own kids into bed before you leave to babysit and then having to get someone else's kids into bed as well! Be clear on any specific house/family rules. Are the children allowed to have fizzy drinks? Are they allowed to kick a football in the house? You can guarantee that if children think there might be some leeway with a new face on the scene, they'll try and milk it if they can. And rules that might seem obvious to you may not be as clearcut to someone who doesn't live in your house. Clarify what the babysitter can or can't do. Do you have any strong opinions on whether the babysitter can have a guest over while they are in your house? Are they allowed to crack open a bottle of wine? Tell the babysitter where you are going and what time you expect to be back. And stick to it or phone if the plans change. If a problem were to arise, it's useful for the babysitter to have an idea of where you are in case something happens to your mobile (you might not hear it ring or you might have drunkenly dropped it down the toilet). Leave refreshments: tea, coffee, wine, beer, crisps, fruit, chocolate, biscuits. The babysitter might not take them, but they'll appreciate the thought. And leave them out on the side, don't just say, there's stuff in the cupboard. For the babysitter, it is much easier to help yourself to something that has been purposely left out than it is to root around in cupboards worrying that you are eating the children's packed lunch supplies. Show the babysitter where to find essentials for emergencies. Where are your First Aid supplies? Make sure you let the babysitter know if there are any medical issues she should be aware of, such as allergies, and how to deal with them. You might also want to let the babysitter know where to find a torch or the location of your fuse box, in case of a power cut. Let the babysitter know if this is a circumstance that would warrant them calling you. A WiFi password is always appreciated. The babysitter might not just want to watch your TV or your collection of box sets. They may be bringing work with them or just want to browse Facebook on their phone or laptop. Come back when you say you will. If you've said you'll be home by 11 and it's nearly midnight, the babysitter will start to worry about what might have happened to you. 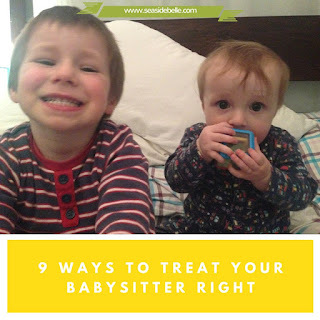 The babysitter might also have to be up early in the morning and will not appreciate staying longer if they didn't expect to - even if you do pay them extra. Sort out transport home if the babysitter isn't driving. The last thing you'd want on your conscience is if something happened as they walked home alone in the dark. And the babysitter won't appreciate paying for a cab out of their hard earned wages. Do you do anything special for your babysitter? I'd love to hear your babysitter tips. I agree with all the above. Also, if you're paying them, clarify what the pay will be before you go out, even a quick "is £5 an hour okay? I'm not drinking so I'll take you home after." as you go out the door will reassure them that you do intend to pay them when you come back and their lift is sorted. I also make sure they know how the TV machines work, as ours has a few quirks. Check that they are okay with your family dog, and if they aren't then shut the dog away. If they are okay with the dog, let them know the dog's rules too! In my house I tell the babysitter "the dog is allowed on the sofa, but only if invited, so if you don't want her snoring on you, just tell her to go away when she does the big eyes at you." Yes, the TV one is a good one. Ours has a few quirks too with different inputs for DVD, Sky or BT Sports.